It probably didn't help that I ate 4 pieces of pizza tonight. I can't recall the last time I ate 4 pieces of pizza. I was famished. I could not get the full signal. And now I'm paying the price. I feel like crap. Icky, stomach ache and feeling like it would feel GREAT to throw up. Hello! I just want to say you inspire me! 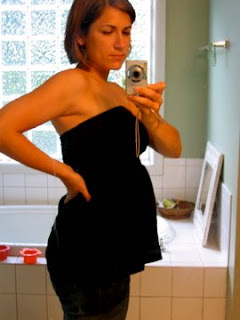 I Googled "weight watchers while pregnant" and stumbled upon you, and have followed you for the past few weeks. I'm working on losing weight before getting pregnant with my 1st, so I'm checking in on you to see how you're dealing with all of it. When I saw this post, I immediately wondered how you're dealing with body image now, because I know that's a concern I'll probably have. Thanks for being so honest! Mental Note: Don't bake cookies!